Croatia’s Plitvice Lakes National Park is a natural beauty spot and also a UNESCO World Heritage site. It’s the country’s oldest and largest national park. The sprawling nature reserve covers 295sq km and is conveniently situated mid-way between the historic cities of Zagreb and Zadar. The popular tourist attraction is one of the most beautiful National Parks in Eastern Europe, and welcomes an estimated 1.2 million visitors through its gates every year. The magnificent limestone canyon-facing Veliki Slap waterfall measures an impressive 78 metres in height, and is definitely the park’s landmark centrepiece. During the civil war of 1991, the rebel Serbs used the parkland as a base for their headquarters. After the war ended it took four years for the land to become reestablished as a park reserve. 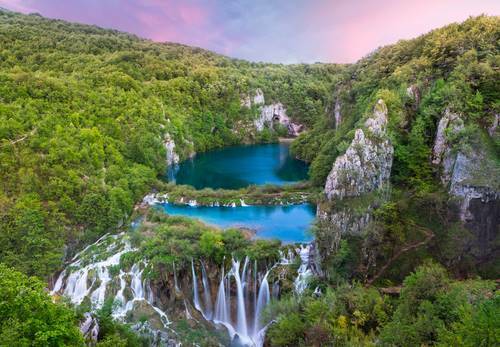 Today, Plitvice Lakes is Croatia’s top tourist attraction and boasts a stunning network of 16 interconnected terraced lakes, 90 cascading waterfalls and beautiful woodlands and forests. The park’s large expanses of jewel-like emerald, azure, turquoise and aquamarine waters are encircled by an endless wooden boardwalk that winds around the shimmering water’s edge. The stunning colours of the crystal clear water are due to the natural mineral composition. If you’re a nature or animal lover, you will easily view Plitvice Lakes as an idyllic paradise. As you explore the breathtaking natural scenery, look out for the indigenous deer, bears, wolves and rare bird species. To fully explore and appreciate the wonderland, it’s recommended that you allow 3-4 hours to get around the landmark attractions on foot. Pack a picnic and find the perfect scenic spot for a lunch break. 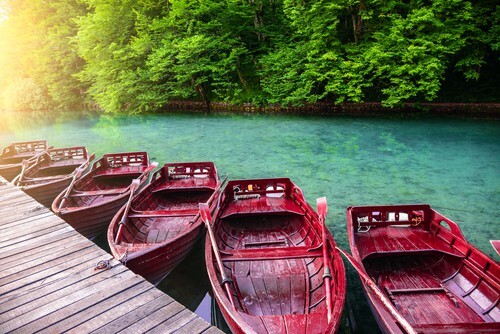 Whilst it’s prohibited to swim in the lakes, you can still explore the water by hiring a boat to sail across Lake Kozjak. The UNESCO World Heritage site features exceptional photo opportunities everywhere that you look. Plitvice Lakes National Park is one of Croatia’s most visited tourist attractions. The network of beautiful interconnected waterfalls has attracted large numbers of visitors since the late 19th century. On a tour of the 300sq km forest reserve you can explore the 16 terraced lakes by following the winding walkways and hiking trails, that go around and over the shimmering waters. Board a boat for a ride across the upper and lower lakes, and admire the stunning 78m high Veliki Slap waterfall. Enjoy the tranquil pace of life, as you take a scenic boat trip to discover the natural beauty of Plitvice Lakes. Traditional wooden rowing boats are available to hire at the lakeside. Hop aboard and row your way across the upper and lower lakes that are interconnected by streams and waterfalls. The spectacular scenery features lush forestry, endemic plants and hidden caves. As swimming in the lakes is strictly prohibited, exploring the national park from the water’s edge offers an alternative perspective. 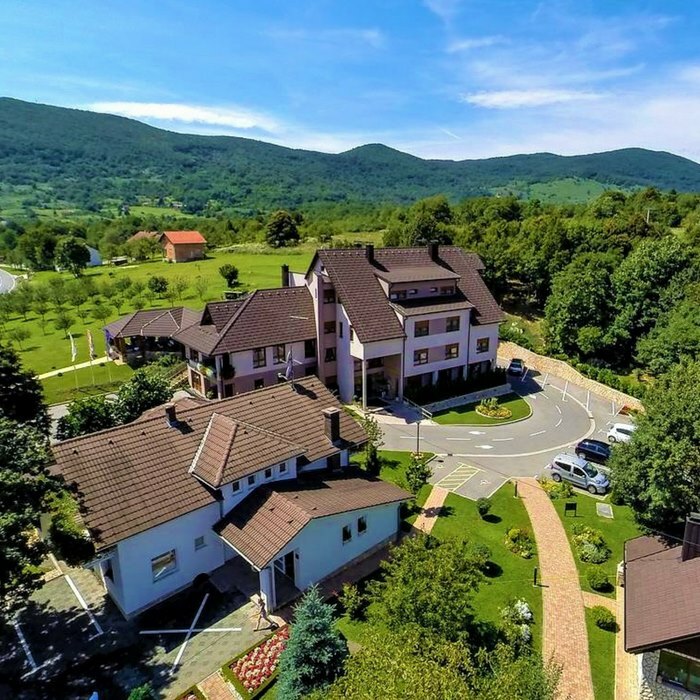 Book your holiday in Croatia at four-star Hotel Degenija, conveniently located just 4 kilometers from National Park Plitvice Lakes in the village of Seliste Dreznicko. This new, family-run hotel has been built in an alpine lodge style and offers a modern interior with dark wooden furniture and floors.